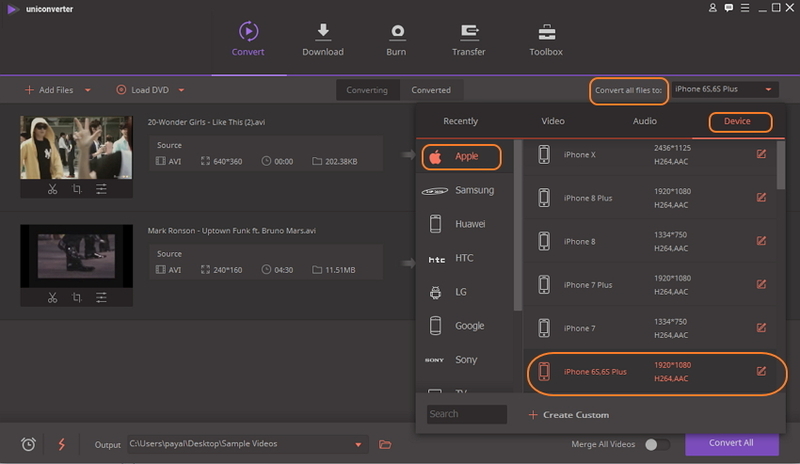 Looking to play AVI on iPhone seamlessly without losing video quality? Wondershare UniConverter (originally Wondershare Video Converter Ultimate) is just an apt program for your needs. This professional tool supports over 1000 formats and preset device-specific formats for video conversion as needed. The process is super fast and results in lossless quality files. Using Wondershare UniConverter (originally Wondershare Video Converter Ultimate), you can convert your AVI as well as other file formats to iPhone compatible format. Moreover, you can also transfer the converted files to your iPhone in a jiffy. Additionally, the programs also allow video download from more than 10,000 sites, DVD burning, and others. It enables to batch convert AVI files to iPhone compatible format. Lossless quality iPhone AVI conversion. Super fast conversion speed (30X faster) for playing AVI on iPhone. Allows editing AVI files before conversion. Transfer converted files to iPhone and other devices directly. Step 1 Open Wondershare AVI iPhone converter and add AVI files. Launch Wondershare UniConverter (originally Wondershare Video Converter Ultimate) on your computer. To add AVI files from your PC, click +Add Files from the Convert tab. You can drag and drop the files and add them directly from devices as well. Optionally, you can edit the added files by clicking one of the edit icons under the video thumbnail. 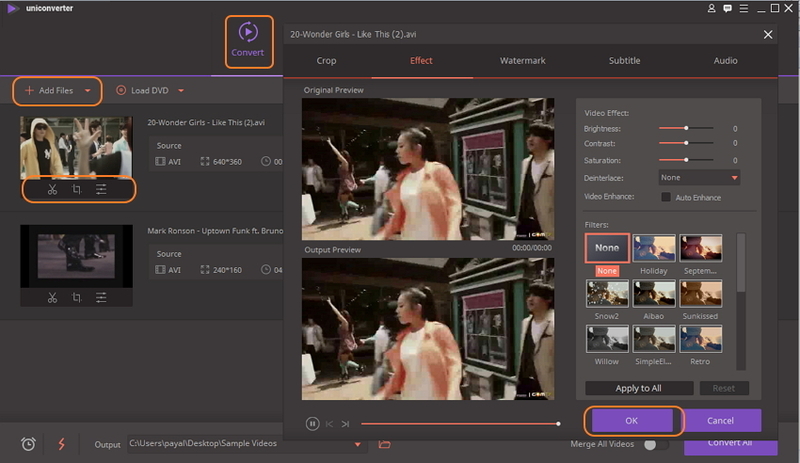 You can trim, crop, merge videos, and add subtitles, apply effects, adjust volume, etc. Step 2 Select iPhone as the target format. On the top-right corner, open drop-down menu at the Convert all files to: option. From the Device list, choose iPhone and desired model on which you wish to play your AVI files, the latest model iPhone Xs is supported. Step 3 Convert AVI to iPhone format. Click Convert All to start to convert AVI to MP4 iPhone format. Once the process is complete, the converted file can be located under the Converted tab. From the Converted tab, you can choose and right-click the file, and select the Add to Transfer option. Using a USB cable, connect your iPhone to your PC. From the software interface, select the Transfer tab. 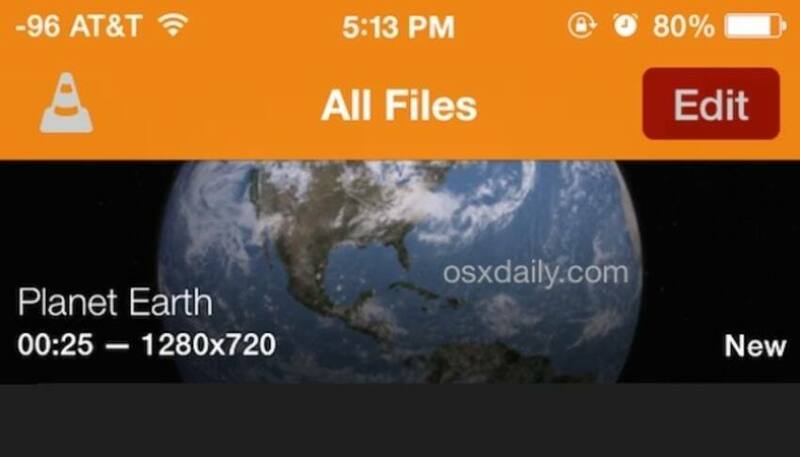 The connected iPhone and converted files will be shown. Select files and click on Transfer All to transfer AVI converted files to your smartphone. You can play your AVI files on iPhone without converting them by using a supported player like VLC. The iOS version of this player allows you to play your AVI, MKV, MPEG, and others file formats on your iPhone. Additionally, the player also facilitates copying the videos to iPhone, iPad, and iPod Touch without any need for iTunes. In order to transfer AVI files from your computer to your iPhone, both the devices need to be on the same WiFi network. Step 1: Download VLC Media Player app on your iPhone from https://itunes.apple.com/us/app/vlc-for-ios/id650377962?mt=8 and open it. 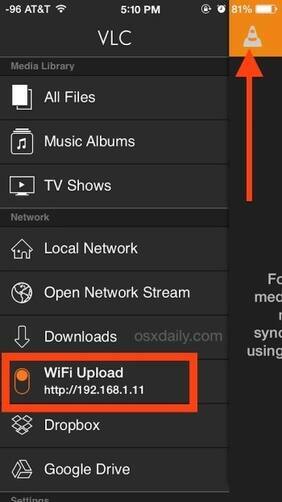 Click the VLC icon on the upper-right corner and then toggle the WiFi Upload switch to the ON position. Note the listed IP address. 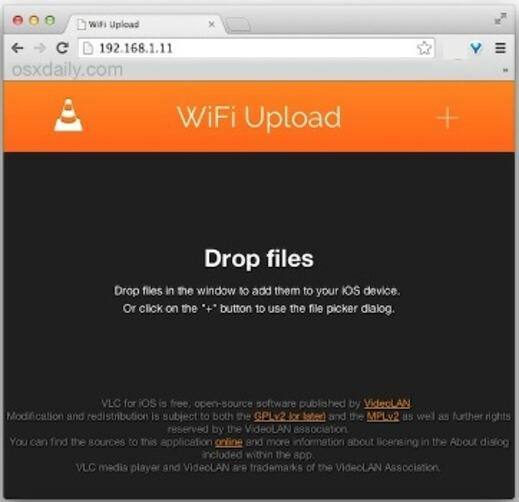 This step will make the VLC upload server active so that you can transfer the AVI files from your computer to your iPhone. Step 2: Open the browser window on your PC and enter the copied IP address. Move the AVI files that you want to transfer on this Window. You can drag and drop the file or click the + button to add the files. As the process completes, the AVI files get transferred to your iPhone. Step 3: Now on your iPhone, you can check the VLC media library for the latest added AVI videos. Select the desired file and click on it to play the video. The above steps enable you to play AVI on iPhone without converting. The software has decoding problems which results in glitches while playing 4K videos. H.265 encoded videos show errors while you play on VLC. Installation of the app occupies space on your phone. The interface seems to be quite outdated. 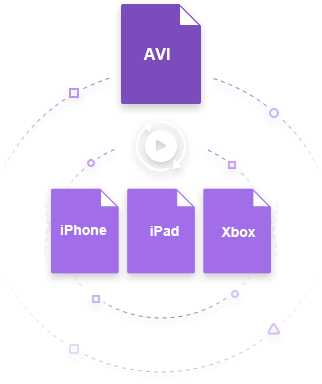 There are a number of free video players available to play AVI files on iPhone. You can install one of these players and enjoy watching your AVI as well as other video formats flawlessly. To help you play AVI on iPhone, listed below are the top 3 players. This iOS app from Olimsoft allows playing almost all types of video and audio formats on your iPhone without any need for conversion. 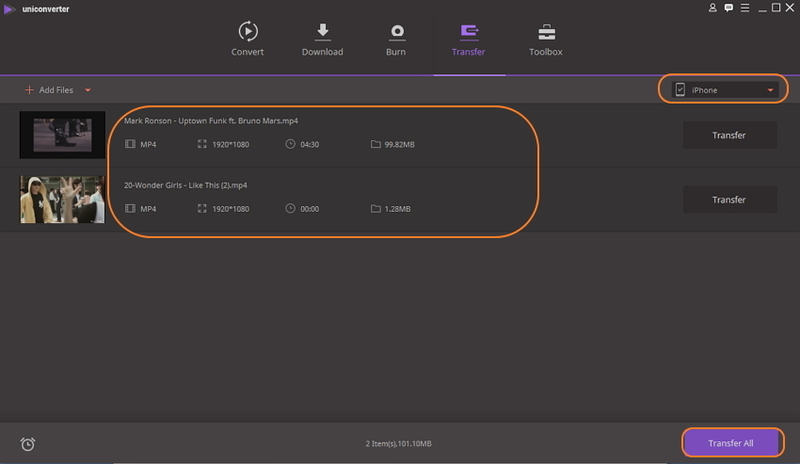 The app facilitates downloading files on your device and also can browse SAMBA/DLNA/FTP/UPnP share on the network. Additional features include adjusting playback speed, background play, landscape play, playing files in PC remotely without any need for download, built-in web browser, TV rendering, lock playing window, and others. Video formats: Almost all movie formats including mkv, wmv, avi, divx, xvid, rmvb, rm, flv, mp4, 4k, mov, 3gp, m4v, blu-ray, ts, m2ts, swf, asf, vob, h265 (hevc), webm. Audio formats: Almost all formats including mp3, wma, wav, dts, ac3, eac3, aac, flac, ape, cue, amr, ogg vorbis. Developed by Shanghai ChangeTech Co.Ltd, this is a top-rated player app that supports playing all popular video and audio formats. To enhance your overall video playing experience, the app supports an array of features like gesture control, audio track selecting, srt subtitle, AirPlay, play control bar with customization option, RockShare file sharing, and others. File import from iTunes, HTTP, FTP, and WebDAV is also supported. Media file management for creating a new folder, moving, deleting, and others are also supported. Audio: mp3, aac, wma, flac, wav, aiff, and others. This app by Xtreme Media Works gives you the freedom to enjoy watching videos on the go on your iPhone and other iOS devices. 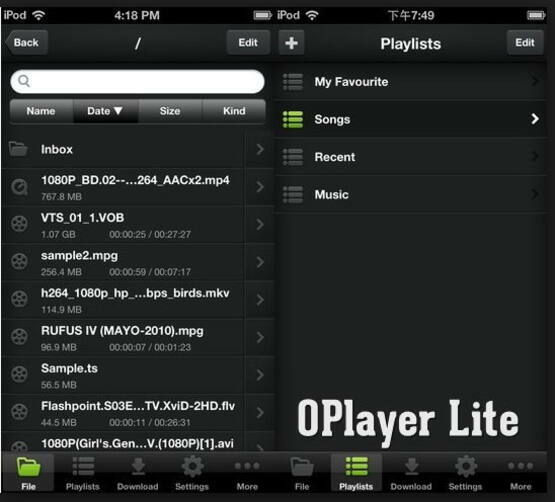 The app supports playing a wide array of formats in good quality. Using the player you can stream the content over the WiFi network and also access the file on your PC through UPNP and SMB. Management of media library, and protecting with password facility is also available. Additional features include Google Cast support, AirPlay support, subtitle download in real-time, and others. In conclusion, if you want to play AVI on iPhone without any encoding problem and play other formats like DVD, ISO, VOB and more without any compability problem, you'd better choose Wondershare UniConverter (originally Wondershare Video Converter Ultimate). So download and have a try now.